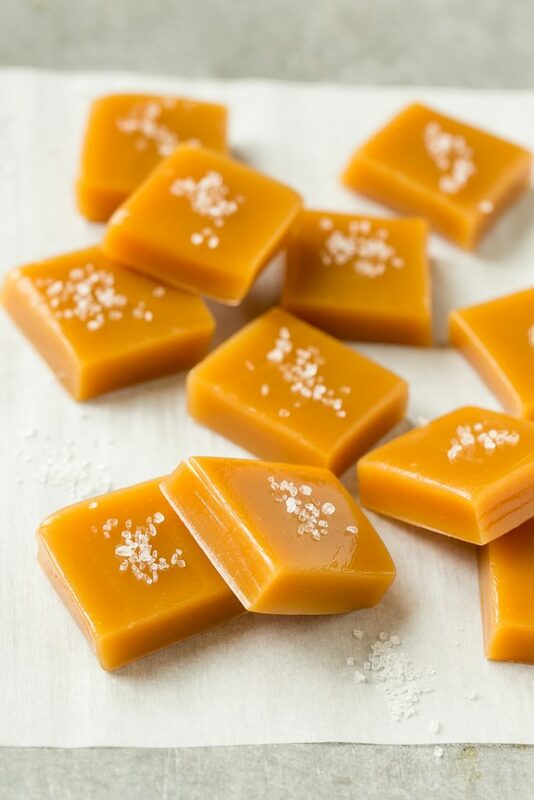 This recipe for microwave caramels is an impressive treat that’s ready in just minutes – top the caramels with a generous sprinkle of sea salt to really make them special! 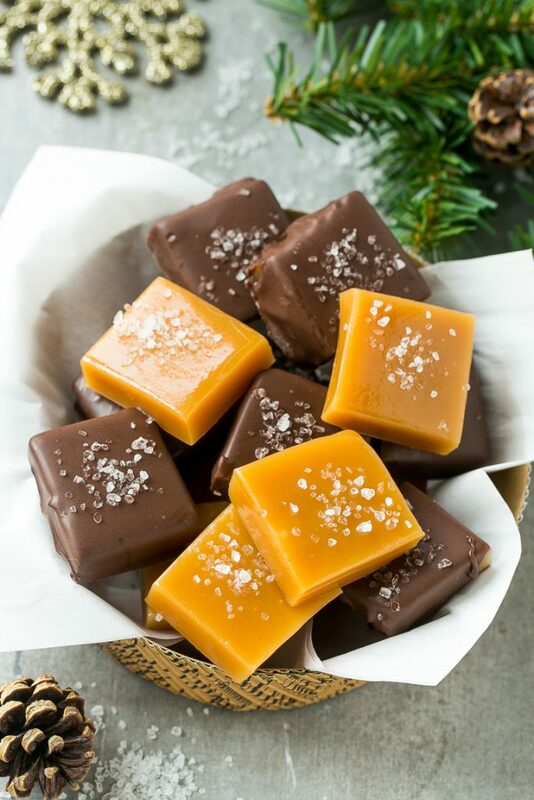 I am so excited to share this recipe for sea salt microwave caramels with you today! I do not consider myself a candy maker by any means, but in a matter of minutes I was able to whip up these beautiful and delicious treats that look like they came straight from the candy store. 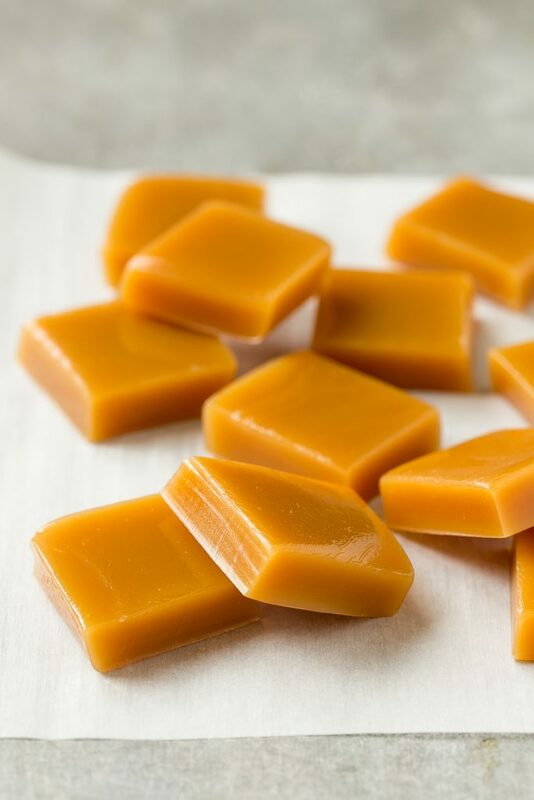 All you need is a handful of simple ingredients and you too can have perfect caramels without having to use a candy thermometer or other complicated equipment! These microwave caramels are made with just 7 ingredients, most of which you likely have in the pantry. The ingredients go into a bowl and get microwaved for 6-7 minutes. Pour the resulting mixture into a greased pan and you’ve got caramels! I couldn’t believe how well this works! There are a few tricks to ensure that your caramels come out perfectly. First, be sure to use a large bowl, as the caramel mixture will bubble vigorously in the microwave and you don’t want it to spill over. In addition, you’ll need to stir the mixture every 2 minutes during the cooking process. You’ll want to be sure to stir very thoroughly so that the caramels will end up smooth and shiny. The cook time for this recipe is 6-7 minutes. If you cook your caramels for 6 minutes, they’ll be on the softer side, perfect for wrapping in waxed paper. The caramels pictured here were cooked for 7 minutes, they’re on the firmer side and can be served as is or coated in chocolate. While the caramels are delicious on their own, there’s a special ingredient that takes them over the top: coarse sea salt. I give my microwave caramels a generous sprinkling of Morton Coarse Sea Salt. This salt has larger crystals that add the perfect finishing touch to so many dishes. I like to add coarse Sea Salt to roasted vegetables, on top of a grilled steak, over avocado toast and on chocolate chip cookies. This salt really enhances the flavor of the caramels by providing a contrast to the sweetness, and I love the added texture from the coarse grains. There are many types of salt that serve different purposes in the kitchen; if you’re using standard table salt for all of your cooking then you’re missing out on some amazing culinary experiences! The salt should be sprinkled over the caramels right after they’re poured in the pan so that the salt will adhere to the tops. If you’re planning to dip your caramels in chocolate, you can simply add the salt immediately after dipping the caramels. I like to do half plain, half dipped in chocolate so that there are options to please everyone. 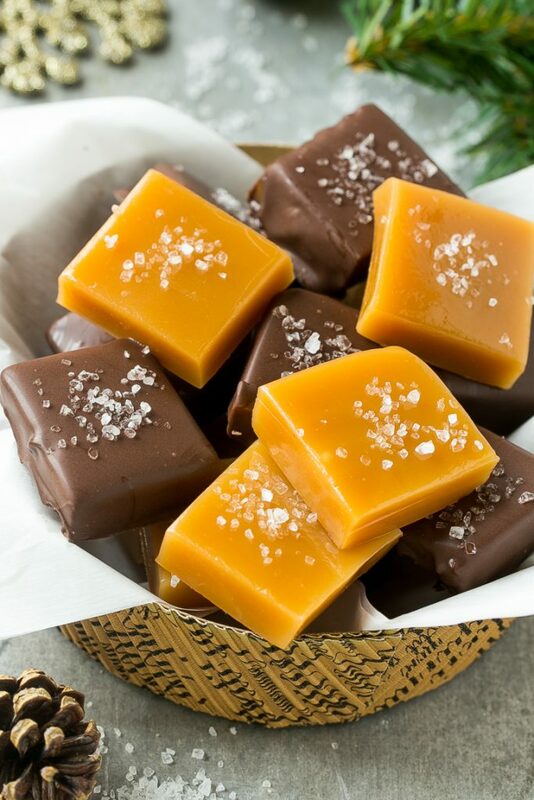 These microwave sea salt caramels make the perfect holiday gift, and they’re a fun and festive addition to any dessert table. Salt is really such a crucial part of cooking, and using the right type of salt can really turn an ordinary dish into something extraordinary. 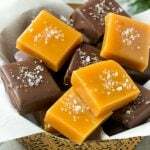 This recipe for microwave caramels is an impressive treat that's ready in just minutes - top the caramels with a generous sprinkle of sea salt to really make them special! Place the butter, brown sugar, granulated sugar, corn syrup, condensed milk and vanilla in a large microwave safe bowl. Line an 8 or 9 inch loaf pan with parchment paper and coat the pan with cooking spray. Microwave for 6-7 minutes, stirring thoroughly every 2 minutes. A 6 minute cook time will produce a softer caramel; 7 minutes will produce a firmer caramel. Pour the caramel into the prepared pan. Sprinkle the coarse sea salt over the caramel. 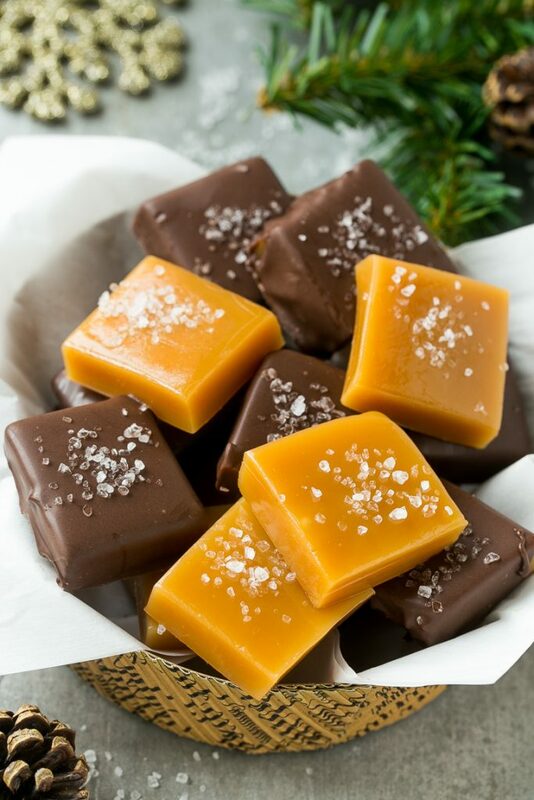 If you're planning to coat the caramels in chocolate, do not add the salt until later after the caramels have been dipped. Let the caramel cool until firm. Carefully remove the slab of caramel from the pan and cut into 1 1/2 inch squares. If desired, dip the caramels in melted chocolate. If you dip the caramels in chocolate, sprinkle the sea salt over the top before the chocolate has set. This post is sponsored by Morton Salt. Thank you for supporting the brands that make Dinner at the Zoo possible! This post was originally published on December 21, 2016 and was updated with new content on September 21, 2017. I have a powerful 1100watt microwave. Should I reduce the power setting to lets say 7 or 8 so that the caramels are not hard? I haven’t had much luck with microwave candy in years past because I think my microwave is more powerful than intended in the recipe. What are your thoughts? Thank you! Yes, I would either reduce the power setting or simply cook the caramels for less time. You could reduce to 7-8 power and cook for the full time, or leave it at full power and cook for 5-6 minutes instead of 6-7 minutes. Hope that helps! I reduced power to 70 percent and cooked for 6 minutes. Caramels turned out perfectly… wonderful consistency to use for turtles. So glad to hear they turned out well!! I’ve made these lots of times and they always turn out great. Now I want to make them to give as gifts for Christmas. I’m wondering if they’ll stay fresh if I make them to ship a few weeks ahead of time? I’ve never had to worry about how long they’ll keep because the never last long in my home! I would say if you dip them in chocolate it should be fine because the chocolate coating will keep the caramels from getting too sticky. If you’re looking to make the caramels without chocolate, maybe try storing them in the fridge in between sheets of parchment paper? I made these and did exactly like the recipe said. The problem I had was I guess my microwave is too high because when I left them at 7 minutes they were stone hard. Maybe I should try for 5 minutes instead of 7 minutes. Any thoughts? They shouldn’t be that hard, I would try 6 minutes next time! I’m sorry you had issues with the recipe, I will try re-testing and see what I come up with. Line your pan with pecans and pour caramel on them and let cool. Then you can cut them into squares and dunk into chocolate. Instant turtles!!! I just made them. They aren’t set yet. I just had a misshap. I’m very short. Was trying to put them in the microwave and hit the bottom of the bowl on the microwave. I had caramel all over the stove top. It cleaned up with hot water. Started over and now waiting for it to set. Mine came out a bit grainy, not sure where I went wrong except the doorbell rang right when I took them out at 7 minutes which delayed my stirring for about a minute? Is it grainy as in pieces of sugar still in the mixture? Somehow I managed to mess up such a simple recipe. I’ve successfully cooked caramels multiple times on the stove top, but I wanted to try these the easy way. Something separated and I ended up with chunky caramel sauce straight from the microwave then chunky caramels. 😜 Any idea what I may have done wrong?? How long did you cook the caramels for? Only think I can think of is maybe it didn’t get stirred all the way and there were chunks of sugar left behind? I made them the other day for 6 min. When I went to cut them they were hard like pesnut briddle Why? Were they hard at room temperature or from the fridge? Mine are hard from the fridge but soften at room temperature. Yeah, that pan in the video is very misleading. I used one that looked similar, and I came out with caramel thins. LOL. I apologize that the video is misleading, I didn’t personally make this video so I’m not sure what size that pan was in relation to the caramel mixture! Just finished making these and they’re lovely. If you’re in the UK like me use golden syrup instead of corn syrup , it gives a lovely flavour. I would found it handy to be given the microwave strength but I did mine at 6 1/2 minutes in a 900watt and they’ve come out nicely. What type of brown sugar dark or light ? I always use light brown sugar because that’s what I have on hand, but either will work! I made these the other day. A big hit! So easy to make and the sea salt is fantastic. Hubby has requested more so he can share at work. 😁Thanks for a great new recipe. No comments from people who have made them? I made them and they’re great!! I want to try dipping in chocolate, but I’ve been told not to melt the chips by themselves, so I’m waiting till I know what to do. I cooked the meal at 6 and a half minutes. Love these!! I use a loaf pan because you’ll end up with thicker caramels that way. I will check with my video person to see what size pan they used for the video, but I recommend the loaf pan. Can you double the recipe? If so would microwave time be exactly double (14 minutes)? I’d recommend making two separate batches in this case, I think the caramel would burn if you tried to double the cook time. Can I add pecans while these are cooking then drop them with a spoon in clusters and dip them in chocolate to make turtles. Yes that would work! You could just add the pecans at the end of the cook time. i LOVE CARAMELS AND THESE SOUND DELICIOUS! I love recipes that are easy to make, I’ll be trying these out!